As accurate as that is though, it doesn't exactly help other people figure out how they can travel, so I decided to write down a few tips that other people can use to help themselves better afford to hit the road. This worked out well as my friends Jessica at Suitcases and Sippycups and Keryn at Walkingon Travels have started a weekly series where people can offer helpful tips to make travel easier for people. I've wanted to write something for their series since they started it, but nothing really came to me and let's face it, I'm not exactly known for my helpful hints. Somehow I doubt this will be any different. Hint #1 - Your kids have more money than you. This is more true the older your kids are. In our family, the kids get an allowance for helping out around the house and at school. With three children, that's a fair amount of money that goes out each month, but simply telling your kids that you need their allowance for travel isn't likely to go over well. Instead, I recommend telling them that the government has implemented a tax on allowances, and that you'll have to start withholding a certain percentage of their allowance to make sure they don't have any tax trouble down the road. If you need the money in a hurry, tell them that the tax is retroactive and that you'll need them to pay back taxes. Might as well get them started hating the tax code while their young. Hint #2 - How much Coke can you drink? There's a lot of Coke in our garage. Seriously...a lot. In fact, when we did the calculations, there was almost enough bottle deposit available to cover a flight for one person. Of course there's a lot of work involved in actually sorting and returning the bottles, but that much hard work should just make you thirsty, and that helps keep the cycle going. Have a Coke and a smile, then book your next flight. Hint #3 - Be vague about your destination. If you want to see people be envious of your travel plans, tell them that you're going to Paris. You'll hear things like "Oh you're so lucky!" and "I wish I could afford to go there." What you most likely won't hear is anybody ask "Paris, Texas?" Sure you could tell them that you're headed to the "other" Paris where hotel rates are a tenth of what they are in France, but what does that really do to advance the conversation? 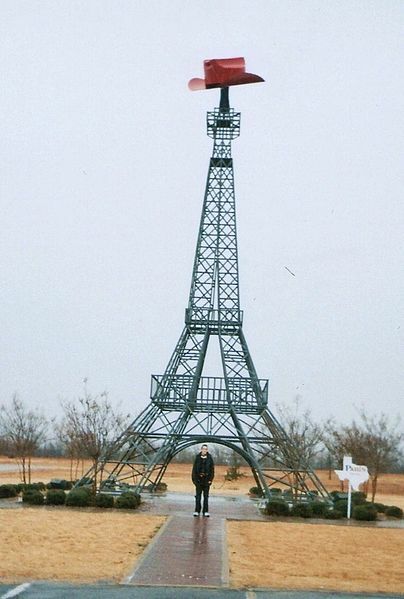 Besides, if all you need as a keepsake of a trip to Paris is a picture with the Eiffel Tower, then Texas has got you covered. You might have to photoshop the hat though. Hey, we all like to travel in first class on the plane, but do ALL of you have to do it? Unless you're crossing oceans, there's plenty of other ways for the kids to get where you're going. Just make sure the driver knows he has to stop if his sister falls off. Hint #5 - Bring your own food. We all know that resort destinations jack up the price on their food, so bringing your own makes perfect sense. It also helps ensure that the pickier eaters in your family will be able to find something healthy and nutritious to keep them going. Ummm...the broccoli and carrots are on the next shelf over. I swear! This post is a part of Travel Tips Tuesday at Suitcases and Sippycups and Walkingon Travels. If you didn't get here from there, you should go check it out. There's people there who can give you some actual tips on how to save money for traveling. Although I still recommend taxing you children's allowance. Just don't let them file for a refund at the end of the year.